The secret to successful carpet cleaning lies with the operator of the cleaning machine. We use some of the most advanced cleaning systems and safest cleaning solutions in the industry but most importantly, we employ only the best carpet cleaners in town. With an average of twenty one years of experience between them, you are sure to get the cleanest clean you've ever seen. Our eight step cleaning process provides excellent results on all types of residential carpeting. Prevacuuming using our TurboVac system. This turbine driven vacuum system removes deep down dust, allergens and pollen and exhausts outside through our truck mounted vacuum system. This exceeds recommended HEPA vacuum standards by removing 100% of the vacuumed soil from your home . Positioning of protective wall guards to prevent any damage to your paint or furnishings. We move and replace your furniture at your request. Preconditioning the carpet with an environmentally friendly solution to emulsify soils embedded in your carpeting. Spot cleaning as necessary for those hard to remove stains. A neutralizing soft water rinse is used to leave your carpeting totally free of any cleaning residues. An application of a sanitizing disinfectant is available for difficult odor problems. Our Spotfree Carpet Protector Plan is available and comes with one full year of free spot cleaning and a money back guarantee. And finally, your carpeting is groomed for that freshly cleaned look. Click these links for more information on pet stain and odor control products and procedures as well as our Spotfree fabric protector plan to help protect your investment. 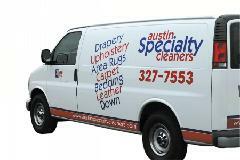 Call us today at 512-327-7553 for your free inspection and written estimate or click here to see our carpet cleaning prices.